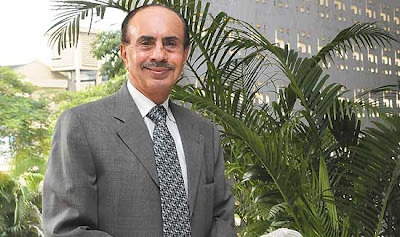 Adi Godrej, Chairman, Godrej Consumer Products Ltd.
Godrej Consumer Products Ltd (BSE: 532424, NSE: GODREJCP) on Thursday witnessed a massive buy of over 21.83 lakh shares by a fund of the noted FII, The Vanguard Group, in NSE. This was disclosed at National Stock Exchange after trading hours on Thursday. The deal amounts to a 0.64% stake in the FMCG major and costs Vanguard Rs. 127.74 crore. The buy was specifically by Vanguard Emerging Markets Stock Index Fund, one of the 21 FII sub-accounts registered in India under the FII account, The Vanguard Group Inc. There were no identifiable institutions selling above 0.50% stake on Thursday. USA based The Vanguard Group, one of the world’s largest investment management companies with assets-under-management (AUM) of $1.6 trillion is noted for its unique ownership structure in which the constituent funds themselves own the management company, as well as for its pioneering role in establishing the concept of Index Funds, and investing in them. Interestingly, its buy of Godrej Consumer Products on Thursday follows the stock’s inclusion in the widely followed Morgan Stanley Capital International (MSCI) Global Standard Indices. The inclusion was announced by Morgan Stanley around two weeks back and came into effect from Thursday. Further proving that this inclusion might have been one buy cue, Vanguard on Thursday also sold off a significant stake in Suzlon Energy, which MSCI has now dropped from the index. Vanguard sold off a 0.67% in the India-based global wind energy major, which closed down by 9.37% in NSE. Inclusions and exclusions from the MSCI index often cause rapid gains or losses in large counters, especially if the underlying company performance truly matches the inclusion/exclusion decision. Many global institutional investors pay attention to this index, and unofficial calculations had shown that Godrej Consumer Products stock can expect an institutional fund flow of up to $52 million which is around Rs. 291 crore. A significant portion of that expectation has happened on Thursday, and maybe in the run-up to this inclusion during the past two weeks. Other major inclusions into MSCI this time has been oil & gas major Cairn India, and PSU banking major, Bank of Baroda (BoB), while exclusions or weightage-cuts were in Maruti Suzuki and ITC. On the fundamental side, Godrej Consumer Products' recently announced financial results for Q4 and FY’12 has proven that it continues to be a reliable proxy for investing in India’s consumer growth story, much like Hindustan Unilever. Consolidated FY’12 sales is up by 32.39%, while consolidated net profit has jumped by 45.95%. While the Q4 consolidated numbers are also good on a year-on-year basis, growth has slowed down in Q4 as evidenced by a slight quarter-on-quarter dip in sales and only a modest growth in profit. However, the stock has continued to run up in an Indian market where most sectors are underperforming, except for consumer goods sector which is seen as a safe-haven or defensive bet. The company's key Indian brands are in home care, personal wash, and hair care segments, and it also has international brand-driven businesses. GODREJCP's Indian brands include Good Knight, HIT, Jet, Ezee, Genteel, Cinthol, Godrej No.1, Godrej Shaving Cream, Godrej Expert, Renew, Colour Soft, Nupur, Kesh Kala, Kali Mehandi, Anoop Hair Oil etc. Godrej Consumer Products has soared from its 52-Week Low of Rs. 370 recorded in early January to a new 52-Week High of Rs. 601 marked on Thursday, which is nearly 63% appreciation within 5 months. On Thursday, the stock had a peculiar trading pattern after hitting this new 52-Week High during the closing hour of trade. It nosedived rapidly by around 12% on heavy selling, but quickly recovered much of that loss, and managed to close at Rs. 580.85 in NSE up by 1.32%. Though heavy-selling is customary during episodes of continued new 52-Week Highs, the sharp dip and instant recovery in the chart was peculiar and hints at a divided opinion by large investors on the stock’s immediate trajectory, if not for any trading glitch. Major investors in Godrej Consumer Products are Aberdeen Global Indian Equity Fund Mauritius, Arisaig Partners Asia Pte Ltd A/c Arisaig India Fund, and Baytree Investment (Mauritus).